I will like to share this amazing story I read on shareably, that a Woman feeds bacon to a shelter dog. The dog escapes and finds his way back to her. Abbey meet her new dog Ted in January when She was working her shift at the SPCA, where Ted had been brought to the previous day. He was quiet and timid and only interacted with Abbey when she wanted to take him on a walk (he refused to) and fed him some cheese-flavored bacon. According to Abbey, She also tried to get a bigger kennel for him, but besides that, she had next to no contact with Ted during her shift at the SPCA. Until she left and went home. 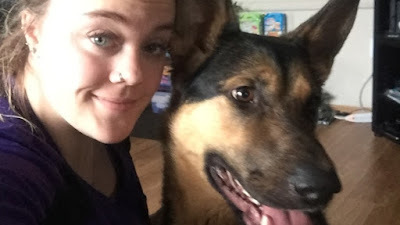 The following morning she woke up around 3 A.M. to prepare for her work at the airport, and when she returned home, she meets a stray dog sitting at her home. Abey said, initially, she was cautious of the dog, but she decided to proceed toward him. It did take a while for the dog to get close enough to her, however she detected a small nick on his nose- similar to the one she had seen on Ted the previous day. “That’s when I recognized, that it had to be Ted,” she said. After a quick call to shelter, she was able to accept that the dog in her house was indeed Ted. Abey said it surprised everyone how Ted finds its way to her home. The SPCA shelter was about 5.5 kilometers far from Abbey’s home and the dog would have had to run past an airport, ponds several neighborhoods, and lakes to get to her exact house. Abbey is presently in the process of adopting Ted. She’s searching for another home to hold her new pet, as dogs are not allowed in her current location. She finally said- “[I’m going to] build my bond with him that obviously, he senses more than I do. [He’s] literally sitting on a platter ready to be loved and taken care of. He’s coming with me.” The two are about to embark on a beautiful adventure, and their story is completely incredible! We hope to see them live a long and happy life together.